Despite five months of below-average temperatures and twice the normal amount of snowfall, NIST's Net-Zero Energy Residential Test Facility (NZERTF) ended its one-year test run with 491 kilowatt hours of extra energy. Instead of paying almost $4,400 for electricity—the estimated average annual bill for a comparable modern home in Maryland—the virtual family of four residing in the all-electric test house actually earned a credit by exporting the surplus energy to the local utility. "We made it—and by a convincing margin," said Hunter Fanney, the mechanical engineer who leads NZERTF-based research. "From here on in, our job will be to develop tests and measurements that will help to improve the energy efficiency of the nation's housing stock and support the development and adoption of cost-effective, net-zero energy designs and technologies, construction methods and building codes." A net-zero energy house produces at least as much energy as it consumes over the course of a year. A number of states are taking steps toward encouraging or even requiring construction of net-zero energy homes in the future. For example, California will require that, as of 2020, all newly constructed homes must be net-zero energy ready. Both a laboratory and a house, the two-story, four-bedroom, three-bath NZERTF would blend in nicely in a new suburban subdivision. But it was designed and built to be about 60 percent more energy efficient than houses built to meet the requirements of the 2012 version of the International Energy Conservation Code, which Maryland has adopted. 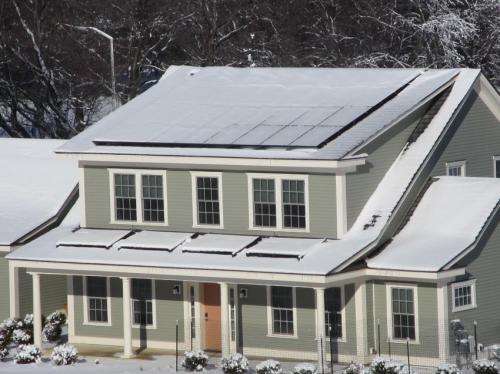 Despite 38 days when the test house's solar panels were covered with snow or ice, the NZERTF's sun-powered generation system produced 13,577 kilowatt hours of energy. That's 491 kilowatt hours more than used by the house and its occupants, a computer-simulated family of two working parents and two children, ages 8 and 14. First year energy use totaled 13,086 kilowatt hours, which was about 3,000 kilowatt hours more than projected usage in a year with typical weather. In a normal year, a comparable home built to meet Maryland's residential energy standard would consume almost 27,000 kilowatt hours of energy. From July through October, the facility registered monthly surpluses. In November, when space-heating demands increased and the declining angle of the sun reduced the energy output of its 32 solar panels, the NZERTF began running monthly deficits. Through March 31, when the house's net energy deficit plummeted to 1,800 kilowatt hours—roughly equivalent to the combined amount of energy a refrigerator and clothes dryer would use in a year—temperatures consistently averaged below normal. Starting in April, the energy tide began to turn as the house began to export electric power to the grid on most days. "The most important difference between this home and a Maryland code-compliant home is the improvement in the thermal envelope—the insulation and air barrier," says NIST mechanical engineer Mark Davis. By nearly eliminating the unintended air infiltration and doubling the insulation level in the walls and roof, the heating and cooling load was decreased dramatically. In terms of cost, the NZERTF's virtual residents saved $4,373 in electricity payments, or $364 a month. However, front-end costs for solar panels, added insulation, triple-paned windows, and other technologies and upgrades aimed at achieving net-zero energy performance are sizable, according to an analysis by NIST economist Joshua Kneifel. In all, Kneifel estimates that incorporating all of the NZERTF's energy-related technologies and efficiency-enhancing construction improvements would add about $162,700 to the price of a similar house built to comply with Maryland's state building code. Planned measurement-related research at the NZERTF will yield knowledge and tools to help trim this cost difference. Results also will be helpful in identifying affordable measures that will be most effective in reducing energy consumption. And research will further the development of tests and standards that are reliable benchmarks of energy efficiency and environmental performance overall, providing information useful to builders, home buyers, regulators and others. More information: *An electric car gets 2.94 miles per kilowatt hour, according to the Environmental Protection Agency (2012). Suppose all homes in a neighborhood were these net-0 houses with solar panels on the roof but no energy storage systems. Come midday, the sun is shining and everyone is exporting power. Who's buying it? Obviously there needs to be a large number of non-generating homes to consume it, or else the power simply goes to waste and the whole system is pointless.